There is likely old technology on your shop floor that is limiting your productivity. You are being robbed of time, profits, and resources in order to keep replacing them. Floppy disks, or as kids these days know it, the “save” symbol on a computer word processing program. Assuming you rightly do not trust used/refurbished floppy disks, you will have to hunt down packages of new floppy disks and hope they work. At about 1.44MB of space on each disk, the question is, why would you want to hang onto this old media source? Answer: The Floppy Connect (floppy drive emulator) will replace this process. The hardware acts as if the floppy drive were never removed. Need: maximum 2GB USB flash drive for it. Keep using the same stick. Switch boxes are best described as manual distribution boxes. They vary from two to 16 switches, or two to 16 connections to one serial port. You manually have to flick a switch to tell the box which of those you want to send the program to. Remember when you had to get up to change a channel on the TV set? It’s similar to that! Answer: The USB Connect Switch Box model automatically does the switching for you. It controls data flow into the CNC from the PC. The hardware also has built-in DNC Firmware for CNC flexibility and is easy to use. Alternate Answer: There is also the Ethernet Connect, which creates virtual serial ports. This means no more manually switching and better yet, it helps you leverage your existing corporate network infrastructure. 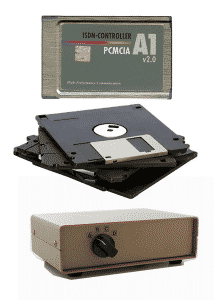 PCMCIA cards are memory cards that have been used in the past on shop floors to get programs uploaded and downloaded to CNC machines. These credit-card-sized antiquities are hard to come by, expensive, and can be damaged by constantly removing them from the controller. Answer: The USB Connect uses a standard USB drive for program storage and meets the communication needs of a variety of CNC machines. This is regardless of machine’s age, make or model. Three models available: a Switch Box model, a standard model, and a Mazak model for sending/receiving Mazatrol CMT files. Alternate Answer: Another replacement solution is DNC software for networking your machines to a PC in order to upload and download programs. If you are still using any of these old pieces of technology, we urge you to contact us at (877) 611-5825. You would be surprised how easy and affordable it is to modernize your shop floor production.